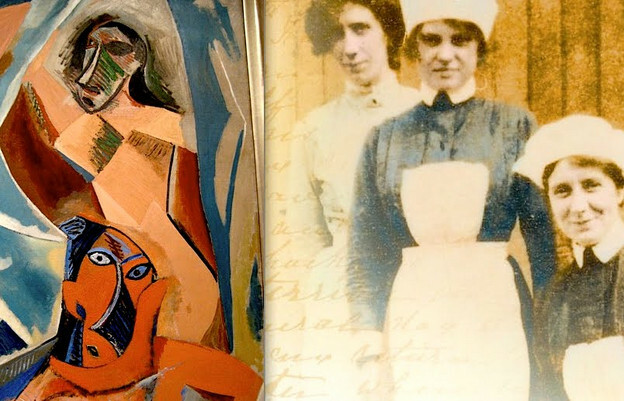 Bob Perelman and Kristen Gallagher on domestic help and modernism (audio): mp3 (3:34). All were from Warsaw, Poland. I’m guessing that “Filreiss” is a real alternative spelling and that “Filries” is a mistake in transcription at some point (these are just guesses). The names were submitted by Mrs. Idia Kcefner (I don’t know who she is) in 1957, by Mr. Moshe’ Koldra (ditto) in 1956, and by Zalman Akerman** in 1999. For more about Zalman Akerman’s story of survival, go here. "Empty of All Possibilities of Adventure"
Here's part of a letter Jose Rodriguez-Feo wrote to Wallace Stevens. The two had not met yet at this point. Their relationship, entirely epistolary except for two brief meetings some years after this, was both extraordinarily intimate and formal--both at once. Stevens loved letters from his young exotic friend "Pepe." Rodriguez-Feo was thrilled to be able to get to know this forbidding-seeming poet, the famously icy Stevens. 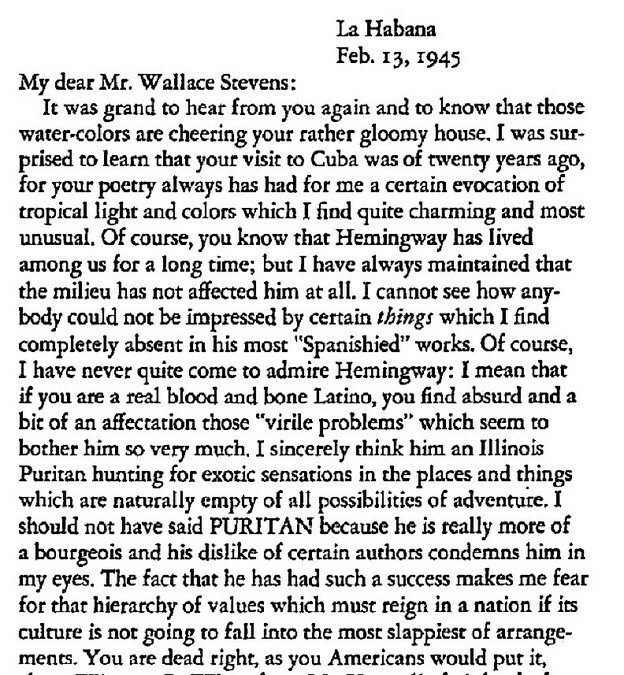 The talk of Hemingway in this letter might have been a signal that the Cuban was interested in Stevens's views of male sexuality, wondering if indeed that was part of Stevens' attraction to corresponding with "a real blood and bone Latino." But Stevens would never, ever nibble on this bait. Now a self-promotion alert: my book, edited by Beverly Coyle, tells this whole story and presents all the letters between the two. Get a copy here. Or ask me for one. I have a few extras at home. If the title of this post is clickable, click on it for a larger view of the letter excerpt above.